A friend loves flamingos. 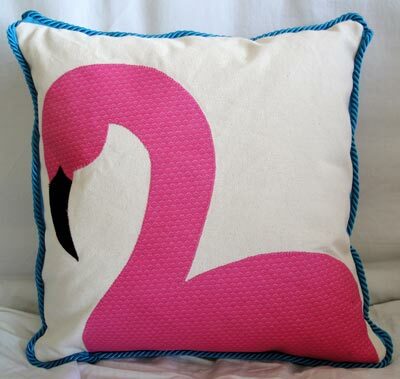 So what to get her for her birthday but make her a flamingo throw pillow. I sketched the shape in reverse onto no-sew fusible paper, ironed it onto some great hot-pink fabric and a small piece of black fabric, and then secured everything with a blanket stitch in matching thread. It's hard to see in the picture, but the fabric even has a little hill-type that could pass for very short feathers. The turquoise cording I picked up in San Francisco at Britex because I wasn't able to find any locally in Los Angeles or Long Beach. Seeing the fabulous buttons, ribbons and bolts upon bolts of fabric made me want to spend a Saturday in the fabric district in downtown Los Angeles. In other news, being without a sewing machine has been very disorienting, but I've been able to use the time to be surprisingly productive - such as creating the new blog banner, getting the paperwork started to finally transform this hobby into a business, and putting together some tutorials to share at a later time on this blog. Speaking of the banner, what do you think? Should I just use a single image? No image? All suggestions and constructive feedback are very welcome.